A highly sensitive and selective H2S sensor with monitor (Model: TPD-BARC 1050) suitable for detection in 10-50 parts-per-million (ppm) range is developed. The sensor exhibits a response (Rair/Rgas) of ~ 500 (@ 50 ppm of H2S) and is selective to H2S with a meagre response (i.e. < 10) towards other interfering gases like NO, C2H5OH, CO, CO2, Cl2, SO2, H2 and NH3. 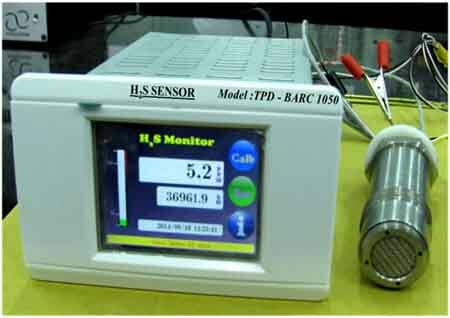 The sensor is coupled to a digital monitor that directly displays the H2S concentration in ppm. The monitor has provisions for programmable alarm set points.